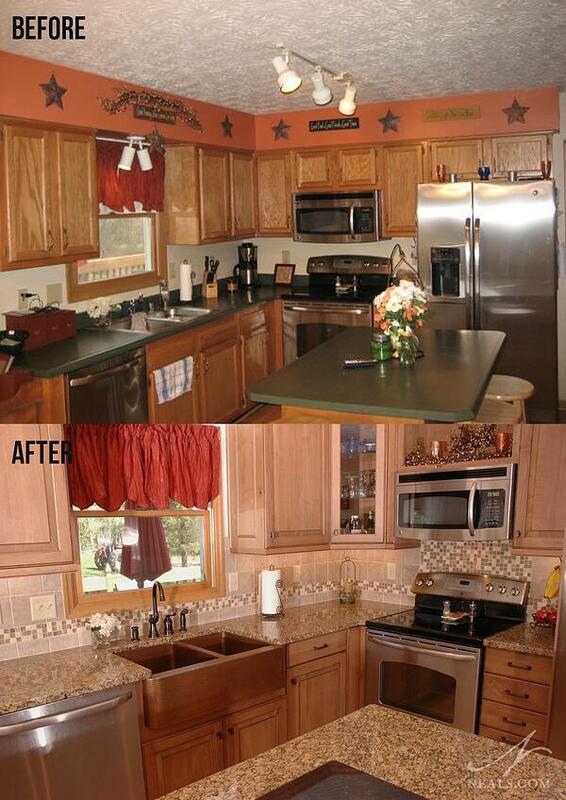 The original laminate counters were replaced with stylish granite for a more-up-to-date look. There are several countertop options on the market, at a wide range of price-points, that offer both a better look and long-term value than builder-grade countertops or anything installed before 1990. Granite and quartz are timeless options that will add to your home's value in most markets. Marble, butcherblock, and soapstone are other high-quality surface options. If your budget is lower, consider an upgrade to a manufactured solid surface such as Stilestone or Corian. It's important to weigh the pros & cons for any countertop surface you are considering, and to discuss installation expectations with your contractor beforehand. 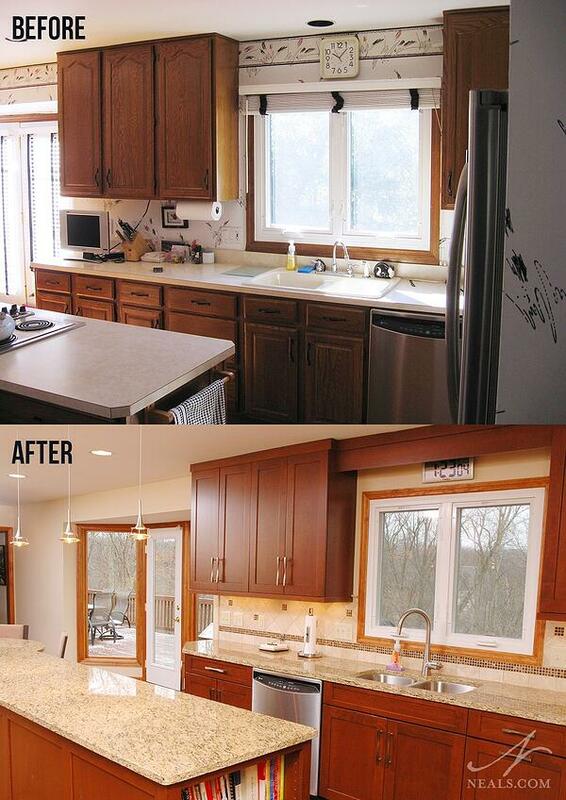 Outdated cabinetry from an 80's remodel was replaced in this remodel with simple and classic cabinetry that will more easily stand the test of time. 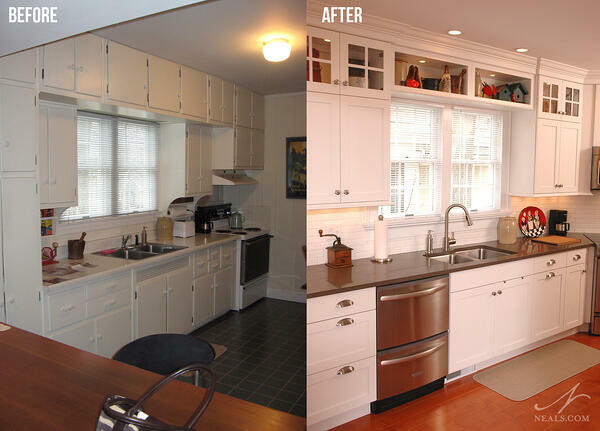 Obviously, changing the cabinetry throughout your kitchen is no small task, and how you go about using or discarding what you already have is a conversation you should have with a kitchen designer. Ultimately, however, it's the look of the doors and drawer fronts that have the biggest impact on the style of your kitchen. There are countless options when you begin combining basic cabinet design, stain or paint finish, and additional finishing or glazes. 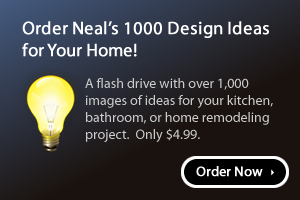 A good place to start is collecting images of kitchens you like on a site such as Houzz, and looking for commonalities. A kitchen designer can help you with your final selection if you're having trouble narrowing it down. Keep in mind that cabinet style and color are directly connected to design style, which in turn is directly related to trends. Your choices here will greatly impact the overall look (and timelessness) of your home. 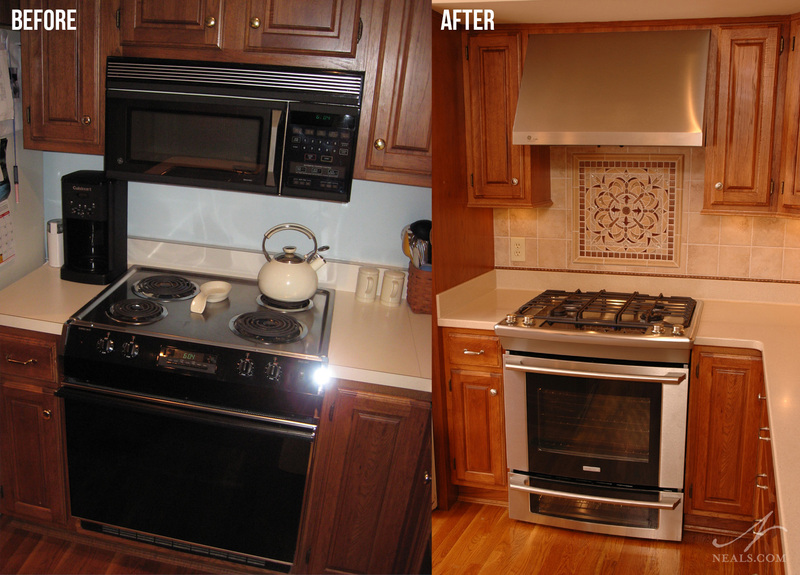 Not only more stylish than the original, this new gas range increases the kitchen's value. There's no denying that some appliances are always going to be worth hanging on to, like that antique cast iron oven in your southern aunt's kitchen. If, however, your appliances are not functioning properly any more, are impossible to keep clean, or are out-dated eyesores, then replacing them will offer a major impact on your kitchen's changes. In the past decade in particular, kitchen appliances have gone through something of a renaissance. Higher-quality units that perform more efficiently with better results for their given task are the standard in home appliances, and in most cases, are worth investing in. Even still, if your budget calls for replacement rather than upgrade, you're still doing your kitchen, and yourself, a favor. In this historic home, a single ceiling fixture provided no task lighting. The new lighting scheme includes undercabinet lights and plenty of recessed lighitng to help the space feel bright. We've talked recently on the blog about adding decorative lighting to your kitchen, which is certainly one way to make an impact. Beyond that, though, increasing both task and ambient lighting throughout the kitchen creates a different type of change that's worth looking into. Rather than relying on one or two large fixtures placed on the ceiling, modern kitchen design uses a range of lighting options to allow you to adjust the lighting for your needs. Recessed lighting, undercabinet lighting, and decorative lighting combined allow you to maximize light during dinner prep, moody ambient lighting for an evening in, or simple task lighting to help you find your way to the coffee maker in the morning. Consider also the type of lighting, and work to replace harsh, yellow fluorescent lighting with energy efficient LEDs or CFLs. 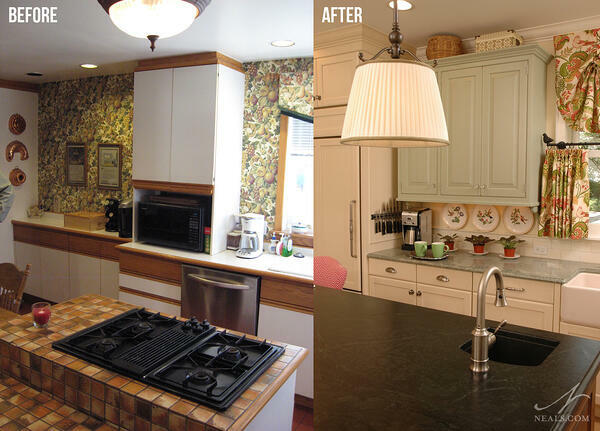 A short countertop header and painted wall, an old-fashioned combination still in use in many homes, was updated here with a fully-tiled backsplash that makes use of large and small scales for interest. The backsplash, which is a material added to the wall between the counter and the underside of the upper cabinets, has a two-fold purpose. First, it protects the wall from cooking spills or accidents, and moisture, any of which can potentially damage the drywall. Second, it provides an opportunity to add style and personality. 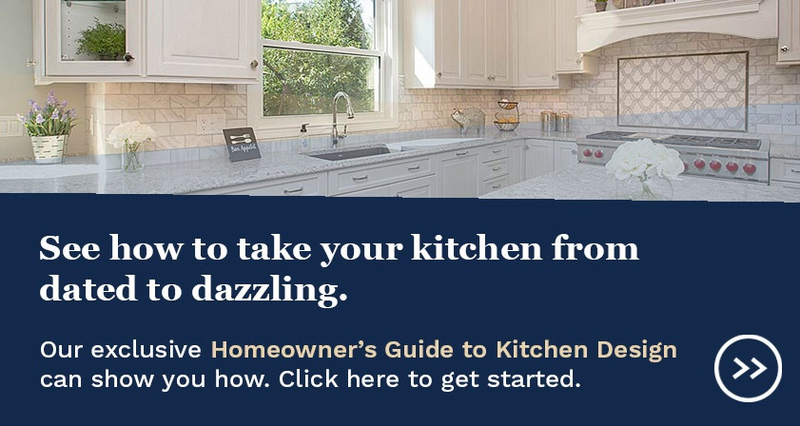 There are several backsplash materials on the market, including tile, glass, and stainless steel, so there's sure to be an option for your tastes and budget.